This Kit is a standard package of our most popular order. The 840 Primo has been the favorite for many who build hard chine boats. Works great on west Greenland Kayaks, and other boats with more flat panel shapes. The 840 Primo is extremely shear. Its very flat and smooth and is the most simple for finishing. Always gives a flat glass finish. The 840 Primo will give you a more translucent boat. Also due to its denseness, it will take less coating, thus it will be lighter weight than the 840 original upon completion. This denser construction also will give you the smallest needle pulls. Because of its tight weave it does not stretch as much as the 840 org and it is recommended sewn wet (especially in warm climate). We do not recommend using the acid nylon dyes with the 840 primo. The weave is very tight and the dye makes a barrier. This barrier does not allow the coating to saturate and integrate with the fabric as well. We have seen delamination issues, and dye wash from the inside after 3-5 years of use. 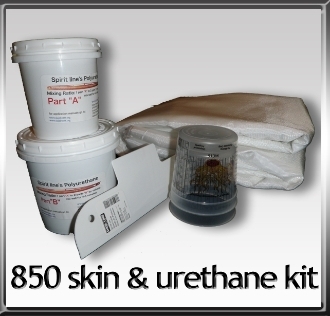 Urethane application is the same as in all fabrics we offer. Also application card and mixing cups. Dampen Cloth while sewing to insure a very tight finished Boat. To heat set, wet cloth and iron dry at hottest setting...moving slowey but never stopping..stopping or ironing dry could cause burning!.cloth should always be wet to damp while ironing. Also recommended for tinting and dyeing. To insure tightness please dampen cloth and keep damp while sewing. Sew damp and never in the sun. try to sew all the nylon products in morning being the coolest part of the day.